Acclaimed, New York Times best-selling author Tom Angleberger delivers a captivating retelling of Star Wars: Return of the Jedi like you've never experienced before, infusing the iconic, classic tale of good versus evil with a unique perspective and narrative style that will speak directly to today's young readers while enhancing the Star Wars experience for core fans of the saga. Star Wars: Return of the Jedi Beware the Power of the Dark Side! by Tom Angleberger is an awesome book! This is definitely one of those books that kids won't want to put down. Even I was so into the book I didn't want to put it down. This is a wonderful book for kids age 8-12. I love the humor thrown in by the author throughout the book. The writing is terrific and the characters are similar to the ones we've come to know in the movie. What I love most about this book is that it takes you much deeper than any movie could. 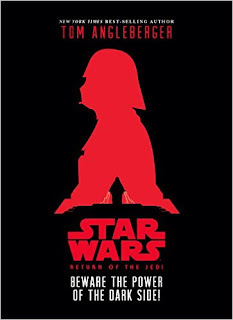 It get's the reader involved and is a terrific book for those that love Star Wars or those just getting to know the beloved Star Wars Series. You can find Star Wars: Return of the Jedi Beware the Power of the Dark Side! by Tom Angleberger on Amazon, Barnes and Noble and other bookstores.